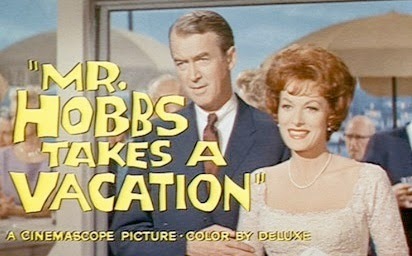 Mr. Hobbs Takes a Vacation (1962). In the best of his 1960s family comedies, James Stewart plays Roger Hobbs, a successful St. Louis banker who has spent too much time in the office. His plans for a quiet vacation are dashed when he learns that his wife Peggy (Maureen O'Hara) has invited the entire family for a a month on the California coast. The clan includes teenage children Katey and Danny, adult daughters Susie and Janie, their husbands, the grandchildren, and the grumpy family housekeeper. To make matters worse, when the Hobbs arrive at their beach house, they find a dump with rotted-out steps, no water pressure, and mounds of dust. Furthermore, except for Peggy, no one wants to be there. Fortunately, this is one of those 1960s comedies where it's inevitable that everything will work out in the end. Thus, Roger spends the summer reconnecting with each of his children in unexpected ways. Veteran screenwriter Nunnally Johnson sneaks in a few offbeat touches, such as Roger referring to his grandson as "the little creep." Still, Mr. Hobbs is a formula picture and a very long one at that (clocking in at almost two hours). Its modest success can be attributed to its likable (and interesting) cast. 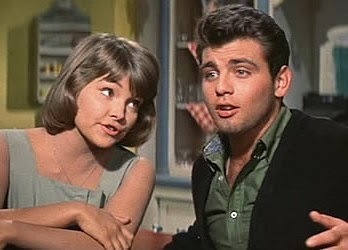 The supporting players include: teen heartthrob Fabian; Lauri Peters, who was Tony-nominated as one of the Von Trapp children in the original production of The Sound of Music and later married Jon Voight; and Marie Wilson, who played the title role in Dean Martin and Jerry Lewis' film debut My Friend Irma. The Night of the Grizzly (1966). Until viewing this film recently, I could have sworn it was about a frontier family fending off a night-long grizzly bear attack. Well, The Night of the Grizzly does feature a frontier family and there's a grizzly--but the plot similarities end there. Instead, we get Clint Walker as Big Jim Cole, who has just moved his family to the town of Hope after inheriting Grandpappy's 640-acre farm ("the richest section of land in the whole territory"). To Big Jim's dismay, he discovers the house needs major repairs and that Grandpappy owed $175 on a $500 loan. The Cole family's problems don't end there: mean Jed Curry (Keenan Wynn) wants the property and Big Jim's livestock are being killed by a 1500-pound grizzly named Satan ("he just kills for the wicked fun of it"). With exteriors shot in scenic San Bernardino National Forest, The Night of the Grizzly aims to be a family film along the lines of Old Yeller. There are amusing scenes (six-year-old Gypsy eating by herself after being sprayed by a skunk) to go along with the grizzly encounters. Unfortunately, there are too few of the latter--for a movie with a ferocious bear in the title, there are not enough scenes with the "savage, senseless killer." All that remains is a perfunctory frontier family saga that wastes nice turns by Leo Gordon and Jack Elam. Gordon plays an ex-convict that hates Big Jim, but has a soft spot for Jim's son Charlie (Kevin Brodie). Elam portrays another of his grizzled town layabouts who develops a sweet friendship with little Gypsy (Victoria Paige Meyerink). George Gobel and Mitzi Gaynor. The Birds and the Bees (1956). After a lengthy expedition in the Congo, George Hamilton II--the heir to the Hamilton Hotdogs empire--boards an ocean liner to return home to Connecticut. Buried in his books and preoccupied with his pet snake Emma, George is oblivious to all the young, fortune-hunting women pursuing him--that is, until he trips (literally) over Jean Harris. The naive George falls hard for Jean--not realizing that she and her father are con artists after his money. Niven as a card sharp. Wait a minute, you say! Didn't I just describe the plot to Preston Sturges' The Lady Eve? You're right, of course, The Birds and the Bees is a semi-musical remake of the Sturges classic with Mitzi Gaynor as Jean, George Gobel as George, and David Niven as Jean's father. While Sturges purists may argue with the casting, Mitzi Gaynor (who has never looked lovelier) gives one of her best performances as the con artist who falls in love with her target. Personally, it took me awhile to warm up to George Gobel's doe-eyed protagonist, but his innate low-key charm eventually won me over. Still, one's opinion on this remake will likely hinge on whether you accept Gobel in the Henry Fonda role. One of television's first big stars in the 1950s, George Gobel had little success on the big screen. However, he continued to be a mainstay on television, whether showing up as a Tonight Show guest or appearing as a regular for several years on The Hollywood Squares. I didn't realize "The Lady Eve" was remade in the 50s. My first thought was, "Why mess with perfection? ", but your review convinced me it might be worth a look. As for Mr Hobbs Vacation, I feel it's two hours too long. Not even the interesting cast can lift this thing off the ground. That's the Henry Fonda role that George Gobel's playing in The Birds And The Bees. Yikes! That's my worst faux pas ever at the Cafe (must have had BALL OF FIRE on the brain). Thanks, Mike. Post has been fixed. I am not a big fan of "Mr. Hobbs" and don't remember "Night of the Grizzly" well, but I really enjoyed "The Birds and the Bees" . I thought George Gobel and Mitzi Gaynor were fun together. I agree that Mitzi looked absolutely fabulous. Thanks for sharing really helpful article with us. Excellent! I admire all the helpful data you've shared in your articles. I can’t wait to read far more from you. Dorothy Lamour Is Bob Hope's "Favorite Brunette"